Preheat your oven to 375°F. Spray an 8-inch baking dish with cooking spray. In a medium bowl, beat the egg and whisk in coconut milk, ¼ cup coconut sugar, vanilla, cinnamon and salt. Stir in the old fashioned oats and add all but 2 tbsp of blueberries, and 5 tbsp of sliced almonds. 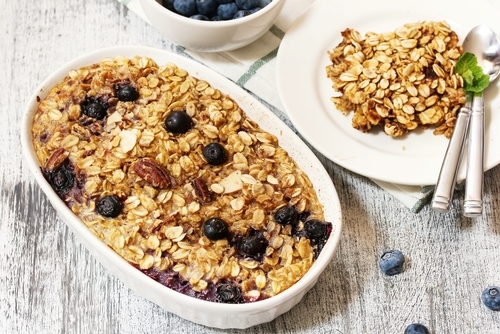 Spread the oatmeal mixture in the 8-inch baking dish, and sprinkle with remaining 2 tbsp each coconut sugar and blueberries and 1 tbsp almonds. Bake for 25 to 30 minutes, until lightly golden on top and cooked throughout. You can either serve it warm or at room temperature. Cover and refrigerate for up to four days; reheat it or bring to room temperature before serving again. This recipe comes from Clean Eating Magazine.